It’s not a birthday without a layer cake. And if you’re going through the trouble of a layer cake, it might as well be chocolate. I’ve made a few chocolate layer cakes. To me, they key is finding the right balance of richness. If a cake is too rich, you can only have a tiny slice, which isn’t very exciting. But you don’t want to to be too light either. I also avoid any cake or frosting that is too sweet. 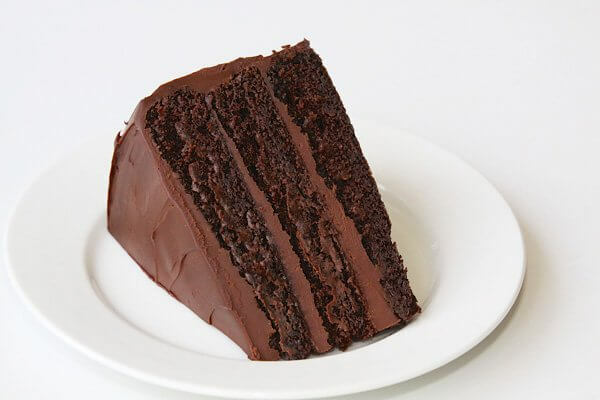 This devil’s food cake is (in my opinion), the best-ever chocolate cake. The cake layers have a deep chocolate flavour without being too dense or rich. The batter contains buttermilk and mayonnaise to provide extra depth of flavour and to keep the cake moist. And the frosting really isn’t frosting at all. It’s a chocolate ganache (just chocolate, cream and a bit of butter). While layer cakes are a bit more work than some simpler desserts, they lend themselves well to making them in advance. I made the cakes and ganache the day before (in fact, the recipe calls for the ganache to sit at least 8 hours before using it). The morning before the party, I assembled the cake, and then refrigerated it during the day. This chocolate cake recipe is now my official birthday cake recipe (but I’ll also bring it out for dinner parties when I want to impress). Hi B! They were 8×2 inch pans. If you have pans that are 3 inches tall, that won’t really make a difference. I always use parchment along the bottom of the pan, and then butter and flour the bottom and sides to ensure my cakes release perfectly!